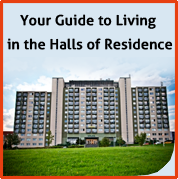 The centre is located at Sázava hall of residence detached from accommodation facilities. There are the following facilities: a large and small conference hall, a lounge with a bar, an office, a cloakroom and toilets. The large hall can seat 75 people and can be divided in two smaller rooms with seating capacity of 42 and 24 respectively. Both rooms have screens, flipcharts and blackboards. For conferences, workshops or other presentations you can use an overhead projector, data projector connected to a PC or a notebook, DVD or VCR. Audiovisual equipment can be used for both rooms or for each room individually. The presenter can use a stationary or moveable microphone. The hall is air-conditioned. The small conference room can seat 24 people and is equipped with the same audiovisual aids as the large hall. Moreover it has special sound effects for home cinema and a visualiser. Due to its smaller area it has no microphones. The hall is air-conditioned. It is used for refreshments and can seat 24 people at tables.